Morning Consult has released a new poll in partnership with Bloomberg as part of the Global Business Forum, Wednesday, September 26th highlighting business leaders’ belief in the economic benefits of globalization and the fear that the global economy has gotten off on the wrong track. Bloomberg’s Global Business Forum gathers heads of states and CEOs to pursue common interests and economic prosperity. The poll, released on Tuesday, September 25th finds that while most Americans agree on cooperation, there is a divide in other areas. 44% of Americans said that the US should act as a convener for the world’s problems while 38% said the US needs to put its own interests first. 36% also believe that free trade has helped other countries other than the US. The Bloomberg Global Business Forum kicks off with a keynote address by UK Prime Minister Theresa May. May will also participate in an interview with IBM CEO Ginni Rometty on free trade as a driver of growth throughout the world. Highlights from the Wednesday schedule include Mexican President Peña Nieto, Swiss President Alain Berset, SAP CEO Bill McDermott discussing that ways in which large demographic changes will impact the global economy and trade around the world. President Bill Clinton will be moderating a discussion between world leaders including Colombian President Iván Duque Márquez, Norwegian Prime Minister Erna Solberg, and South African President Cyril Ramaphosa on global leadership in trade. Bloomberg founder Michael Bloomberg will be giving opening and closing remarks. 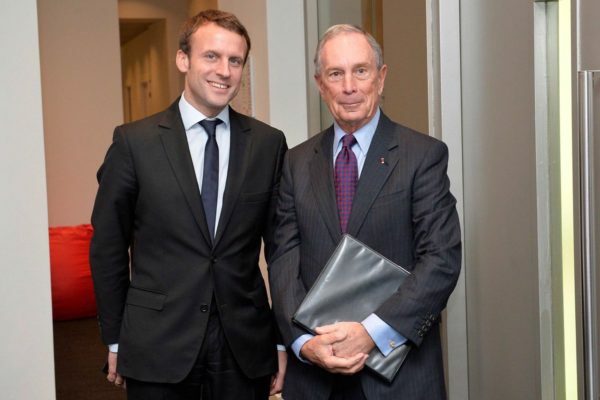 Wednesday will also feature the One Planet Summit, French President Emmanuel Macron’s initiative in partnership with UN Secretary-General António Guterres and World Bank President Jim Yong Kim. The Summit was launched to help aid countries in fulfilling their part of the Paris climate agreement and bring coalition countries together with private industry to forge public-private collaboration. Many world leaders will be participating in Wednesday’s events including Spanish President Pedro Sánchez Pérez-Castejón, Malaysian Prime Minister Dr. Mahathir Mohamad, Netherlands Prime Minister Mark Rutte, and New Zealand Prime Minister Jacinda Ardern. Other notables participating on Wednesday include European Commissioner for Competition Margrethe Vestager, Managing Director of the IMF Christine Lagarde, Uber CEO Dara Khosrowshahi, BlackRock CEO Larry Fink, Ford CEO James Hackett, Anne Finucane, Vice Chairman of Bank Of America and Goldman Sachs President David Solomon. Here’s are the crosstabs for the Morning Consult/Bloomberg poll.